[S204] Bernice Ruth Mahoney entry, Birth Certificate (24 January 1907). [S286] John J. Healey household, 1930 United States Federal Census, New Haven, Connecticut, population schedule, Waterbury, ED 5-255, sheet 121, dwelling 57, family 78. [S1281] John J. Healy household, 1940 United States Federal Census, New Haven, Connecticut, population schedule, Waterbury, ED 5-24, sheet 4B, number of household , 78, shows Bernice R. Healy. [S204] Bernice Ruth Mahoney entry, Birth Certificate, shows the father of Bernice Ruth Mahoney as Percy Mahoney (24 January 1907). [S284] Percy Mahony, 1910 United States Federal Census, New Haven, Connecticut, population schedule, Waterbury, ED 465, sheet 17B, dwelling 148, family 359, shows age 3. [S285] Hannah Smith household, 1920 United States Federal Census, New Haven, Connecticut, population schedule, Waterbury, ED 432, sheet 15B, dwelling 101, family 276, shows age 12 and Connecticut as birthplace. [S286] John J. Healey household, 1930 United States Federal Census, New Haven, Connecticut, population schedule, Waterbury, ED 5-255, sheet 121, dwelling 57, family 78, shows age 23 and birthplace as Connecticut. [S1281] John J. Healy household, 1940 United States Federal Census, New Haven, Connecticut, population schedule, Waterbury, ED 5-24, sheet 4B, number of household , 78, shows age 33 and birthplace as Connecticut. [S60] Waterbury Connecticut Street Directory, Percy Mahony, 1912; Page 502. [S209] Waterbury, Connecticut City Directory, Page 564; shows Anna Smith. [S429] Wedding Invitation, Beatrice Aida Mahony, 8 November, 1927, shows Williard Street. [S253] Unknown volume, Jacklyn Healey's Birth Certificate: shows the residence of the father as 4 Simons Avenue, State of Connecticut Bureau of Vital Statistics. [S1281] John J. Healy household, 1940 United States Federal Census, New Haven, Connecticut, population schedule, Waterbury, ED 5-24, sheet 4B, number of household , 78. [S60] Waterbury Connecticut Street Directory, John J. 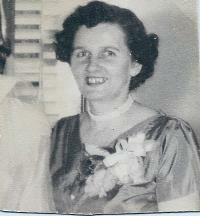 (Bernice R) Healey, 1952; Section H, Page 404. [S371] Death Dates of Relatives Who Died in 1977 written by Bernice Ruth Healey, 1977. [S1005] John J. Healey, Feb. 17, 1977 Tombstone, Pine Grove Cemetery, 850 Meriden Road, Waterbury, Connecticut. [S1005] Bernice R. Mahony, Mar 16, 1997 Tombstone, Pine Grove Cemetery, 850 Meriden Road, Waterbury, Connecticut. [S1005] Bernice R. Mahony Tombstone, Pine Grove Cemetery, 850 Meriden Road, Waterbury, Connecticut. [S1201] John Healey's Certificate of Baptism: shows mother as Bernice Mahoney, 13 August 1939, Saint Francis Xavier Church. [S1281] John J. Healy household, 1940 United States Federal Census, New Haven, Connecticut, population schedule, Waterbury, ED 5-24, sheet 4B, number of household , 78, shows mother as Bernice R. Healy. [S924] Who's Who In The East, Biography of John A. Healey, shows "son of Bernice Ruth (Mahoney)." [S1011] The Waterbury Republican-American, 29 July 2009, Page 4B, shows that he was the son of the late Bernice Mahony Healey.